I’ve been making this salad for years ever since I first cut out the recipe from the Sunday Life magazine. It’s a Karen Martini recipe and what I like best about it is the way she treats brown rice, in such a star-studded way. There is nothing faintly hippyish, dour or self-consciously wholesome about this salad. 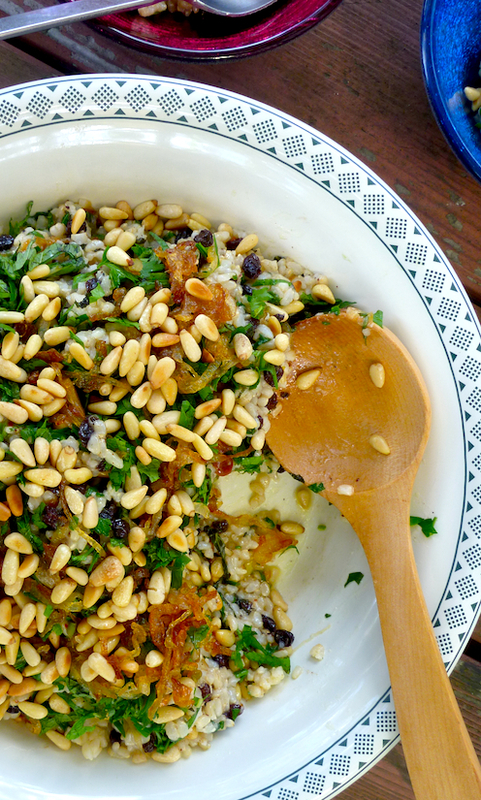 Packed with pine nuts, currants and caramelised onions, it is gloriously rich and luxurious – not your typical brown rice treatment at all. In fact, if this salad was made with white rice, it would kind of sink beneath the riot of rich flavours. It needs the nutty substantiality of brown rice to make it all work. While I came across this recipe in the Sunday Life magazine, I have noticed it has been published in a couple of Karen Martini’s cookbooks since, attesting to its perennial popularity I would think. It is a great party salad, particularly after the Christmas festive season, when the wholesomeness of the brown rice gives it a grounding effect after the season of excess. This recipe makes quite a lot of salad, so it can feed a bit of a crowd but if there is any left over, it makes great lunch fare the next day. Although I like brown rice, I tend to use jasmine or basmati rice as my everyday rice. If I am eating brown rice, I prefer to eat it quite plain in the macrobiotic way, with a few simple toppings. This salad is one of those glorious exceptions to my ‘brown rice’ rule. If you are a brown rice skeptic, or have been scarred by eating undercooked brown rice, try this salad and you just may be converted. 2 cups of brown rice. 125 mls of olive oil. 3 brown onions, halved and sliced. 150 grams of currants, just covered with red wine vinegar, simmered for 3 minutes until the liquid has almost evaporated, then drain and keep the liquid for later use (see step 2 below). half a bunch of flat leaf parsley leaves (chopped finely). half a bunch of mint leaves (chopped finely). 2 green chillies, finely sliced. 120 grams of pine nuts, toasted until lightly golden, in a cast iron frying pan. First, prepare your brown rice. Rinse and drain your brown rice. I like my brown rice very well done, so I often soak it for an hour before cooking it. Place rinsed rice in a sauce pan with 4 cups of water. Add some salt to taste, bring to a boil, cover and gently simmer on a very low flame for 30–35 minutes, until the water has evaporated. Take off heat and keep covered so it will still be warm when needed. Heat 4 tablespoons of oil in a large non-stick fry pan. Add onion, season with pepper and salt and cook slowly over a low heat for about 30 minutes until onion is caramelised. Add the reserved vinegar liquid and currants. In a large bowl, mix brown rice, parsley, mint and chilli in a large bowl. Mix together lemon juice and remaining olive oil and pour through rice. Mix through half the onion and currants and half the pinenuts. Place salad in serving bowl and top with remaining onion and pine nuts to serve. This salad sounds so good! Just perfect for a quick lunch. I might add in some chickpeas to make it a full meal. You could add chickpeas but it’s also satisfying as meal just as is. one of my faves, too. you’re right on all counts. a glorious feast of rice. am often surprised (though i cannot think why) that karen martini’s meat-free meals are so damned appealing – and satisfying to boot. lovely shots, e.
um HORRID spelling error….”counts”…a thousand apologies…. I think I’ve corrected it, I’m a sloppy proof checker with my comments too. I love Karen Martini’s recipes I’m just waiting for her definitive cookbook to put her up their in the parthenon of Australian cookbook queens. I only have her ‘Cooking at Home’ but find that I use her quite often these days. Quite frankly I do watch ‘MKR’ to relax if I have the time and have liked her comments there. Am smiling as Karen Martini has come up twice now on local blogposts! As I said before it took me awhile to begin a love affair with her presentation and cooking, but now use a lot or her recipes. Am an avid brown rice lover and this is just a little different to my current recipes, so thank you and it will be tried!! I love her melding of the middle eastern and European traditions and she does such good home style fare. reading that has made me very hungry all of a sudden, sounds fabulous! 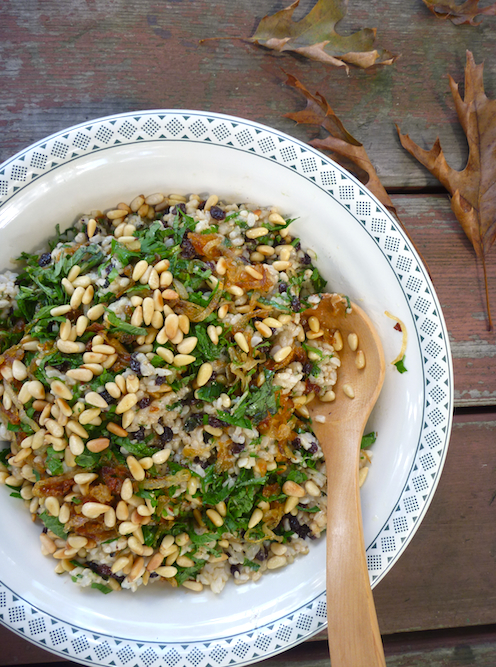 I’m a huge fan of brown rice salads and this one sounds particularly delicious. My boyfriend won’t eat pine nuts (weird, I know) so I’ll have to make it when he’s not home to complain! It makes a lot of salad so halve it or make it to take to a barbecue or party. I haven’t heard of many people who don’t like pine nuts but this has quite a lot of pine nuts in it so he really, really wouldn’t like it. I made this for a gathering of gluten-free, vegan mums and it went down really well. I love the mix of flavours and textures, and the shed load of herbs! We had the leftovers for dinner with salmon, a great combination. Thanks Lizzy! Vegan and gluten free! That’s some very tight dietary perimeters to work within. I’m going to make this for dinner tonight. I sounds delicious. I’m trying to clear out my cupboard and have some currants I want to use. I was thinking originally of an Ottolenghi leek recipe with currents but I’m going local. Next up will be vegetarian mapo tofu. Thanks BYLT. I’ve just made this brown rice salad for dinner. Instead of raisins I used pomegranate instead. 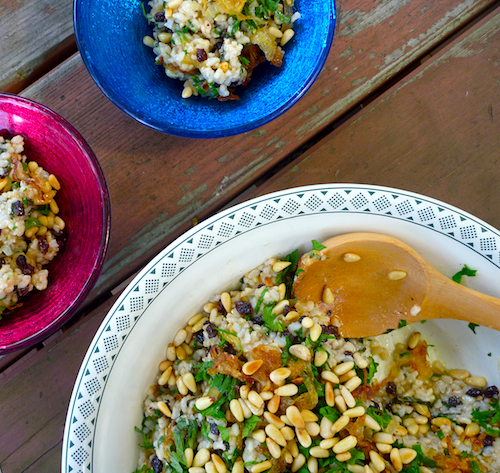 This is truly one of the best brown rice salads I have ever eaten. Looks amazing! Can I substitute the red wine vinegar with something else? I’ve got balsamic vinegar and lemon juice…would that work? Also, do you think pistachios or slivered almonds could replace the pine nuts? Trying to use up what I have at home!